UPDATE: Over the weekend, the Jefferson County Republican Party deleted the post, though officials still have yet to comment. 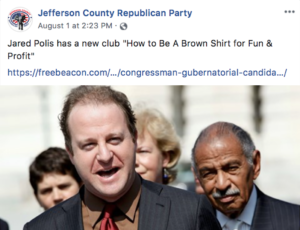 The Jefferson County Republican Party referred to Congressman Jared Polis as a “Brown Shirt” in an August 1 Facebook post. “Brown Shirt” is a nickname for a member of the Sturmabteilung, Hitler’s Nazi militia which beat and murdered those who opposed his rise to power. Polis, who is Jewish, is Colorado’s Democratic nominee for Governor. Votes matter. The cause to prevent Jared Polis from becoming Governor is not served by crawling into the gutter with the worst most juvenile put downs. More people will be attracted to the cause by well thought out and reasoned arguments made with only good humor. Classy is clean, common sense but most importantly effective. It is the only way this race will be won. Think about it. Chairman Webb did not respond to an email request for comment. Yes, openly homosexual Jews were Hitler's secret weapon for ensuring the preeminence of the Reich. Especially those photographed with a black man standing in the frame. On the bright side, Polis isn't wearing a tan suit. Ironically however he is wearing a "brown shirt"
Yes he is. Does that make him anti-Semitic? I would think the Jeffco Repubs would be ecstatic that Polis is a very fine person as Trump describes them. Can you confirm that you think that Polis is an anti-Semitic now because he wears a brown shirt? No. No I can't. In fact I think Polis is a very fine person and believe he will, rightfully, be the best candidate and win. He does however happen to have a brown shirt on. I couldn 't help but chuckle over that myself. But since fascist thugs used br own, black, silver and even red, it's kind of hard to be fashionable and apolitical at the same time. has anyone taken Bronco orange for their political freikorps? That picture was clearly taken after his makeover! Straight eye for the queer guy, Michael? Oye Vey! Smacks palm to forehead. Being insensitive seems to be a genetic trait among these "saved" Pro-Lifers. Winguts have long been uniquely susceptible to Nazi Tourette's, but this one's a howler even by their standards. Besides, what's the big deal? There are some "very fine people" among the neo-Nazi and white supremacist communities according to our Republican POTUS. But first, this Public Service Announcement on AMERICAN VALUES from the Huerfano County Republican Party. Doesn't Polis have dual citizenship in Israel? Apparently Jewish Brown Shirts are a thing over there. Wonder how their wall is working out? Shouldn't you be hosting a Bake Sale for the NRA? Ammo sale! Fill two 30 round mags for the price of an order of chicken wings….. Source only chicken breeds that are approved by Global Animal Partnership (GAP) as having higher welfare outcomes. We will work to ensure our suppliers are in compliance with this commitment via third-party. TGI Fridays has committed to shell and liquid cage-free eggs in 2018 and look to purchasing 100% cage-free eggs within ingredients-based supply chains by end of year 2024. Our commitment to responsibility also extends to ingredient integrity and clean label enhancements. We are reviewing all our ingredients and are removing/avoiding ingredients with added MSG or artificial trans fats. We continue to review each ingredient in our recipes with the goal of removing artificial colors, flavors, sweeteners and preservatives. This is in conjunction with our efforts to reduce sodium on our menu. We are on a sustained journey to provide the best produce…by working closely with our suppliers to source safe, sustainable, high-quality ingredients from farms, fields and oceans. What kind of snowflakey ecoherent shite is that? If you're a true-red NRA gunhead – you source your rare red meat from cows and pigs that suffered short, miserable lives, slaughtered with an AR15 and/or machete, with the rest of the meal drenched in lard, full of GMOS , pesticides, preservatives, gluten, salt, and sugar, preferably after the meat has been on a month long hiatus back and forth to China, processed by an enslaved immigrant, to truly MAGA. Better look into it. TGIF does not MAGA the NRA way. City o City has some fabulous vegan wings that are better than any chicken wings I ever tasted! Seriously? 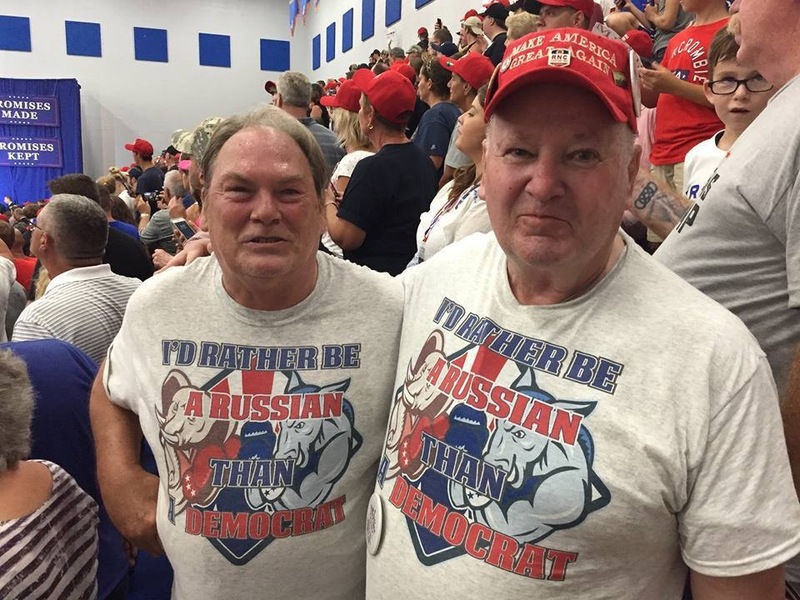 Doesn't Trump have dual citizenship in Russia? Doesn’t Eduardo Rafael have/had Canadian citizenship? He did, but when it came out, he said he was planning on denouncing renouncing the Canadian citizenship. Anyone know if he actually went through with it? He did renounce it in 2016. Cruz is a slimedog in many ways. It appears our p-grabber-in-chief now has a wider range of options. Sasha Cohen strikes again. We need to ask Moderatus and Andrew Carnegie if either wants to be next in line. And give up their AR-15’s? They may have to get special dispensation from Dudley before they could commit? Democracies cannot function without reason and respect for truth, which is why totalitarian movements seek to obliterate both. It’s only when the mob is unhinged and dependent on its leader for direction and for truth that the leader can get away with cruelty, corruption, blatant falsehoods and illegality that would not otherwise be tolerated. The survival of our democracy requires that we not merely jettison Trump and his sycophantic party from power and attend to repair of our democratic institutions, but that we also insist on a level of rational, civil discourse and respect for facts. Mobs cannot practice democratic self-governance; for that we need an engaged, rational citizenry. And by the way, if you didn’t think it was important to turn out to vote, then consider whether you want to be governed by the politicians who thrill that crowd in Tampa.